fototazo: The Image: Hiroshi Watanabe, "Flying Octopus, Akashi, Japan"
The Image: Hiroshi Watanabe, "Flying Octopus, Akashi, Japan"
Hiroshi Watanabe: This photograph titled "Flying Octopus, Akashi, Japan" was taken in a city named Akashi in the western part of Japan, west of Kobe. 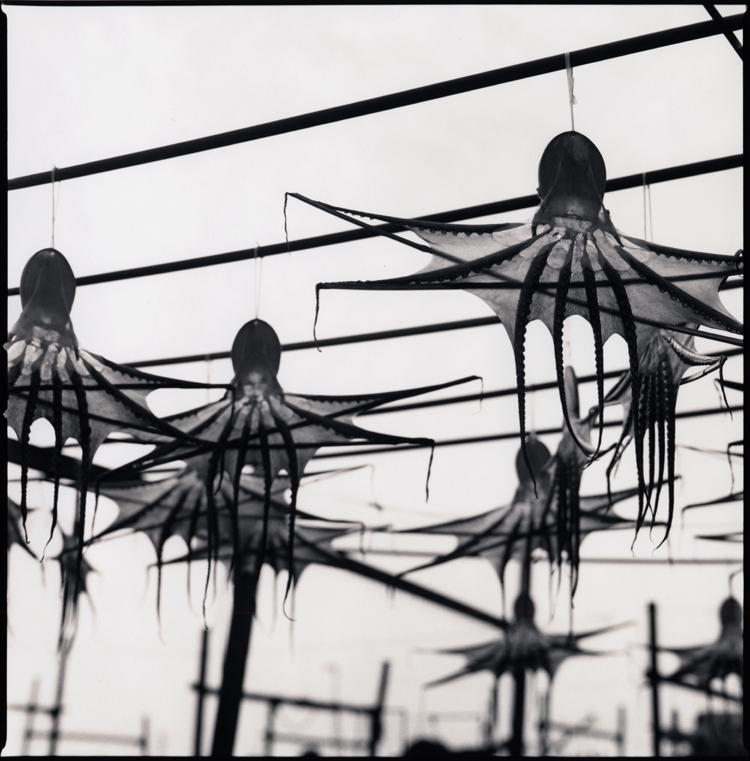 In its fishing port, octopuses are caught in the summer, and stretched and dried under the sun. When it is dried and hardened, the shape is retained and it looks like a kite. People shred it and bite into it for taste and flavor. It is a Japanese version of beef jerky in the US. It is interesting to know that octopus in Japanese is "tako" and the word also means "kite," although Kanji (Chinese character writing that Japanese use) for each are different. I doubt dried octopus was used as a kite, but they probably used the word as they look very similar.